One thing we love is to give our girls matching Christmas pjs to wear on Christmas Eve. Pajamas are always my favorite gift to get and to give over the holidays. You might remember I've featured Soma sleepwear a couple of times in the past. 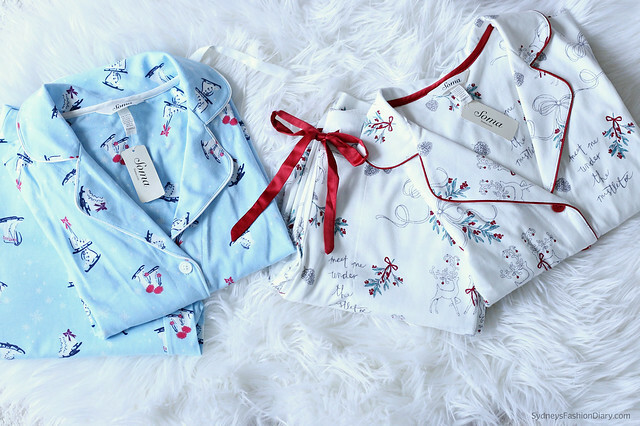 I am delighted to work with them again to show you some of the most adorable pajama sets this holiday season. These jersey knit pajama separates are from their luxurious soft collection. As the name suggests, they feel incredibly soft, cozy and keep me warm without overheating. These sophisticated pajamas also make the perfect gift for all the ladies on your list. Sleepwear is one of those things you wear everyday but would not necessarily buy for yourself. For all short ladies out there, these pajama bottoms are available in multiple lengths (short, regular and tall). I am wearing a size XS short in this post and the length is just right at 28.5". Last but not least, can we just take a moment to acknowledge how adorable these prints are? If you're interested, these pajama separates are currently buy one get one 50% off (plus 15% your entire purchase with code 89647). They definitely add some holiday cheer to your Christmas morning. I love Christmas pj's, these are so cute!